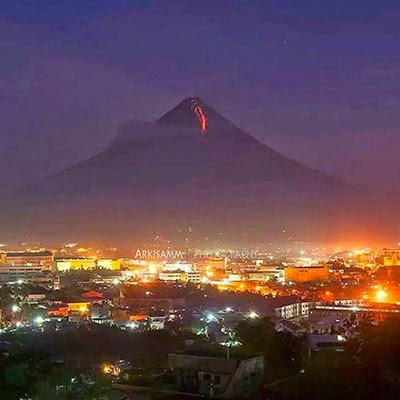 LEGAZPI CITY--As tens of thousands of families are evacuated from the danger zones, tourists who want a glimpse of Mayon's glowing crater are pouring into the province. To ensure their safety, several sites have been identified by the Provincial Disaster Risk Reduction and Management Council (PDRRMC) as safe vantage points. These include Lignon Hill, Cagsawa Ruins Park, Daraga Church, Legazpi City Boulevard, Taysan Hills, and Quitinan Hills. All are outside of the danger zones, the PDRRMC clarified. Meanwhile, several tourism activities are strictly prohibited. Among these are ATV rides towards the volcano, Mayon climbing or trekking, playing Golf at the Dona Pepita Golf Course, and all other recreational and exploratory activities within the 6-km permanent danger zone (PDZ) and 6-8 km extended danger zone (EDZ). The office also reminded the public that last year, tourists and a tour guide who were exploring the volcano's slopes when it was prohibited, lost their lives.